“Local governments are at the heart of the innovation process, being both innovators and facilitators for innovation.” Mayor of Santander and CEMR President Iñigo de la Serna began his speech with this statement at the 2nd World Assembly of Local and Regional Governments, on 16 October 2016 in Quito, just before the official launch of Habitat III. This assembly was an opportunity for over 300 local and regional elected representatives from around the world to submit a joint statement to the Habitat III conference and to commit to contribute to the achievement of the New Urban Agenda. The New Urban Agenda is a global guiding document that defines how we should build, move and live together in cities, in order to secure a sustainable future. Addressing the audience, Iñigo de la Serna stressed the importance of innovation and how CEMR makes innovation a way of life at the local level in Europe. Thanks to infrastructure, policies and services made possible in part by CEMR, citizens are empowered to innovate – not only technologically, but also in political participation, via e-Government for instance. Other high-profile speakers included UN secretary general Ban Ki Moon, President of Ecuador Rafael Correa, and UCLG President Mpho Parks Tau. As its name suggests, Habitat III is the third UN Conference on Housing and Sustainable Urban Development. Forty years before Quito, Habitat I took place in New York in 1976, when 37.9% of the world’s population was urban. Habitat II took place in Istanbul in 1996, twenty years later, and 45.1% of the world’s population was urban. Today, that number has reached 54.5%. There were also three preparatory committees before Habitat III. The so-called “Prepcom” meetings were meant to, unsurprisingly, prepare the Habitat III Conference, in terms of organisation as well as content, and draft the New Urban Agenda. The Prepcoms were open to all UN member states as well as local and regional government representatives and other stakeholders. 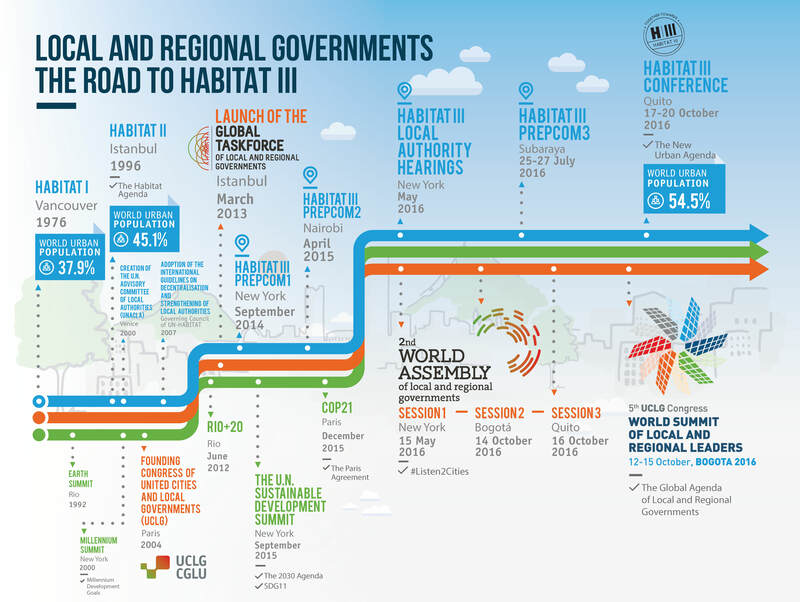 Prepcom1 took place in New York (USA) in 2014, Prepcom2 in Nairobi (Kenya) in 2015, and Prepcom3 in Surabaya (Indonesia), just a few months before the Habitat III Conference. The Habitat conference takes place every twenty years. Following that logic, Habitat IV should take place in 2036. Before that, the focus will be on the implementation of the New Urban Agenda, adopted in Quito. In fact, the Quito Implementation Plan Platform will soon be launched: an online tool to monitor the implementation of the Habitat III outputs, the platform will be open to all to share information and will be part of the legacy of Habitat III.